I believe there us a metal piece that goes over the trranny hhump and under the center console. Do you have that? Also do you have swivel bucket trim skirts?? I need one, probably the drivers side (have to check again) but if they are black, I would take both. hi abennett6060 i need the trunk emblem for my 73 for now. Hi there - I'm looking for seat belts for swivel buckets, chromed plastic for opera windows, (don't need the corner), and also the shifter cable for a console. Let me know. Looking for headlight bezels for a 75-76 Laguna S3, a rear body panel for a 73 Malibu, and a needle in a haystack Rear Spoiler for the Laguna. Dinomyte wrote: Hi there - I'm looking for seat belts for swivel buckets, chromed plastic for opera windows, (don't need the corner), and also the shifter cable for a console. Let me know. What color swivel bucket belts you looking for? Still need a shifter cable? Limey just posted a pair of NOS opera window moldings for Malibus @$99/pr. Cheaper than the repops. Would you happen to have a factory volt gauge? I have the amp gauge currently and would like to change it over. 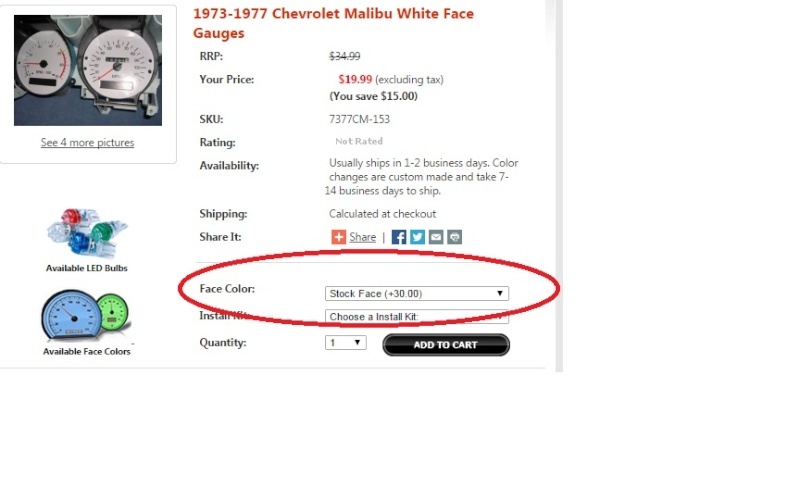 whitegauges.net says they have the factory color available. If all you need is a refresh on the gauge, I suggest contacting them. I bought my white faces from them and they have been good to work with. Thank you for your response- I will contact them and see what is available. i have an extra complete cluster with tach, but need the 75-77.